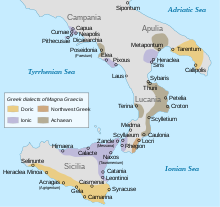 Magna Graecia (Laitin meanin "Great Greece", Greek: Μεγάλη Ἑλλάς, Megálē Hellás) is the name o the coastal auries o Soothren Italy on the Tarentine Gulf that wur extensively colonized bi Greek settlers; pairticularly the Achaean colonies o Tarentum, Croton, an Sybaris, but an aa, mair loosely, the ceeties o Cumae an Neapolis tae the north. The colonists, who began arrivin in the 8t century BC, broucht wi them thair Hellenic ceevilization, which wis tae leave a lastin imprint in Italy, pairticularly on the cultur o auncient Roum. This page wis last eeditit on 30 October 2014, at 11:45.